The 2 lb. 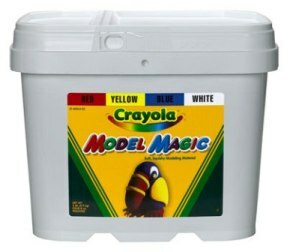 bucket contains four 8 oz packages (1 each of White, Red, Blue and Yellow) Model Magic. Fun, unique, air dry modeling material allows children to make keep able arts, crafts and toys. Soft and pliable for easy use. Not messy and doesn't crumble. Decorate with paint or markers when dry.